This month, we are focusing on how our amazing staff improve the health and well-being of Sojourners! Throughout May, staff will put on small recitals to showcase their skills. 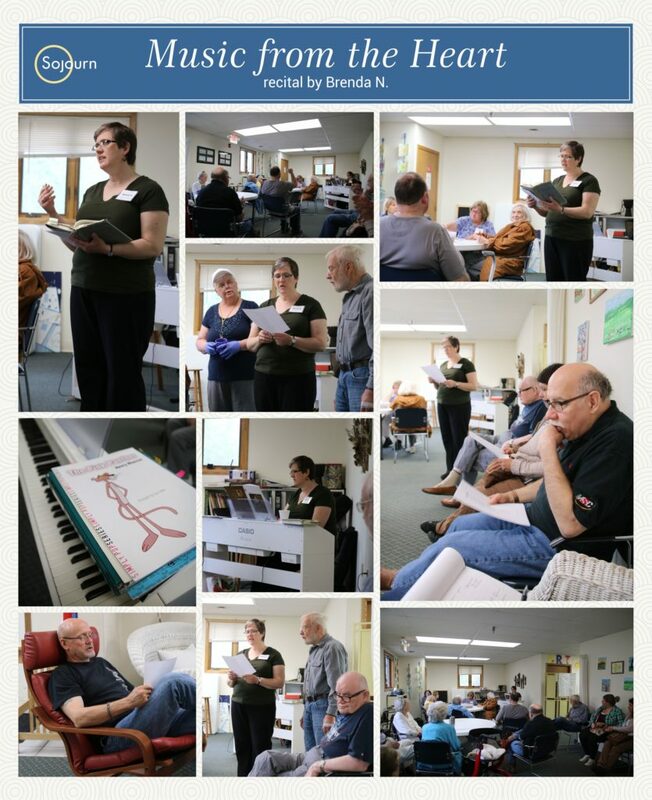 On Wednesday, May 9, Brenda entertained and raised the spirits of Sojourners with a wide variety of piano melodies. “What is one of your favorite things—any thing?” Brenda asked the room, and she took the time to hear each Sojourner’s response. Answers ranged from traveling to France to the simple joys of peanut butter! After reading a poem about one of her favorites (the ocean), Brenda jumped into some favorite melodies on the piano. From hymn arrangements to movie themes, classical pieces to patriotic tunes, Brenda had a tune for everyone! She took time to announce each song and talk about it, sparking good conversation and laughter. Once she started playing, everyone settled in to listen. The delight and peace in the room was palpable. All joined in to sing “The Hills are Alive” from Sound of Music and Louis Armstrong’s “What a Wonderful World.” Smiles, snapping fingers and tapping feet showed the positive effect of each song. Brenda has loved the piano since she was 9 years old. She took lessons in middle school and high school and played often for her church. She has been at Sojourn for over a month and is loving every minute of it. We love having you, Brenda! Thank you for improving the mental and emotional wellbeing of everyone at Sojourn!